Welcome to a series of posts that are dedicated to going beyond the shine of technology by examining ways to use digital tools to engage students in real learning. In this fourth post you will discover how careful examination of the nouns and verbs in a standard can help you write learning targets that will point to valuable resources. In this post I would like to investigate how examining the nouns and verbs, as we did in the last few posts, allows an educator to write learning targets for their students. These learning targets can then be used to search the internet for lesson plans that can make learning both engaging and relevant. In the last few posts we discovers nouns that could uncover OER (Open Education Resources) and verbs that could lead to important digital tools that allow for process development. Learning Targets describe what students will know and be able to perform in relationship to the curricular standards. Proper activities and learning experiences aligned with the nouns and verbs of the standards provide opportunities for Learning Targets to be written. Let’s take a look at the five steps from the first post of the series. The point of emphasis for this article is step number five below. In the preceding post of this series I provided the following standards and listed the nouns and verbs I thought might be important. I have provided those example standards and the relevant nouns and verbs below. Examining the standards in this way allows the teacher can now reflect on content and process. It helps an educator understand the important concepts and process skills students should walk away from a lesson with. This content and process can now be written as Learning Targets. Providing Learning Targets to students in a language they understand allows for ownership of learning to occur. It is this ownership that can make the learning experience powerful. Using the above standards with an emphasis on the included nouns and verbs suggests the following student centered Learning Targets. 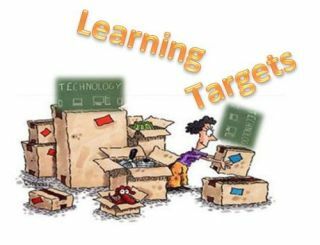 With these Learning Targets in hand, it is now possible to search the internet for lessons that will allow these targets to become a learning reality. Remember that the teacher must put a focus on locating lessons that include technology. Equally important, the technology must provide focus back on the standard. It is also important to emphasize those nouns that can lead to great OER content as described in Post Two, while determining how the verbs will supply the correct digital processing tool as described in Post Three. Please feel free to visit the links provided below to help identify possible lessons to align with important Learning Targets. I wish you the very best as you go beyond the shine of new technology in your search for learning that really does meet the standards. (Please Note: You will see that many of these links will land you on the resource page and not the home page. In some cases you may need to sign up for an account). Graphite Lesson Flow– Formerly known as App Flow, Graphite’s lesson Flow from Common Sense media allows teachers to incorporate the very best in digital tools, while highlighting their pedagogical insight. Watch their video to learn more about Lesson Flows or make your own and share it by clicking “Create your own lesson flow” when you visit the site. Gooru– Browse thousands of K-12 collections made by teachers, or search over 16M resources. Best of all, contribute your own while you share and learn from others. Explore Gooru’s ability to provide lessons with formative assessment and feedback. Learn Zillion – This site has some wonderful vetted lessons. First you must become a member… which is free. Then visit the resource area and do a search. You will note some lessons are free and some may have a small cost. Blendspace – While Blendspace is all about the ability to create lessons in under five minutes, I am pointing you to another amazing area in Blendspace. At the Blendspace Gallery you will be able to find valuable lessons already prepared and ready for you to use. While you are there, create and share some of your own possibilities! Nearpod – Some of you may already be aware of amazing way teachers can build a lesson in Nearpod and turn it into an interactive classroom experience. Did you also know that Nearpod has a wonderful collection of lessons? Some are free and others may come with a small fee. It is worth the trip! Share My Lesson – Welcome to a place where over 300,000 amazing lessons can be found.Share My Lesson pledges that their members can download and share user-generated resources free of charge forever. Feel free to find new lessons and also share your own.Content uploaded by a user always remains the property of that user. PBS Learning Media– While best know for some amazing videos, PBS Learning Media also has some wonderful lesson plan resources and interactive. You will also be amazed at the engaging teacher tools for the 21st century classroom. Better Lessons – This is a site that links to English and Math Common Core along with Next Generation Science Standards. Here you will find over 10,000 lessons written by educational professionals. The link takes you to the resource section. OER Commons – This Open Educational Resource site was already mentioned in the post that emphasized content and nouns. It must also be pointed out that this site also has some great lesson ideas from multiple open education providers.. Lesson Plan Data Base – This is a very simple search engine data base that I built and house at my site. You will find that it links up to lesson plans in all subject areas. It uses many of the same strong educational sites that Thinkfinity (which is no longer available as a search engine) once used. Be sure to use the search area under the words “Lesson Search”. Make sure you check it out. Finding the technology in the standards can open a whole new world of possibilities. Whether it be emphasizing the nouns of content, the verbs of process, or seeing how they all fit together in learning targets. I do hope you have found some valuable ideas and resources. Perhaps you may now look at standards in a whole new way! Finding that technology in a standard allows you to go beyond the shine… and into an exciting world of relevant and engaging learning!